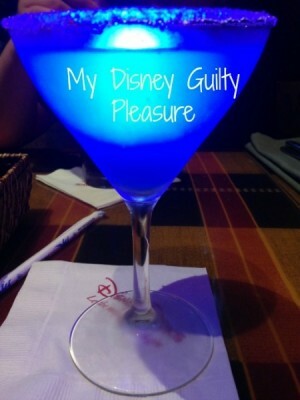 My Disney Guilty Pleasures...and Perhaps Yours Too! My Disney Guilty Pleasures…and Perhaps Yours Too! Whenever I plan a trip to Disney I get excited about scoring a coveted Advance Dining Reservation, organizing the FastPasses on day 60 before our adventure begins and receiving MagicBands in the mail. All that makes me giddy with excitement, but there are also those moments at Disney that are must do items for me and perhaps you, that others just don’t understand (and some of those others are my family members). I call them my “guilty pleasures”. Would my trip be ruined if I did not get to indulge in them? No. Would I feel a little pang in my heart if I missed doing them while at my favorite place? Probably. I have outlined my top ten list below, maybe you will agree with me maybe not. 10. Starbucks– Yes, I know I can get a Starbucks anywhere, but a Disney Starbucks just tastes better. When walking into EPCOT, I like to stop at the Starbucks located in the Fountain View, grab myself a cold beverage and sit next to the Fountain of Nations. Just sitting there first thing in the morning, listening to the heart pumping, take on the world music makes me smile and I am sure it’s not the icy Java Chip Frappuccino that is giving me goose bumps. 9. 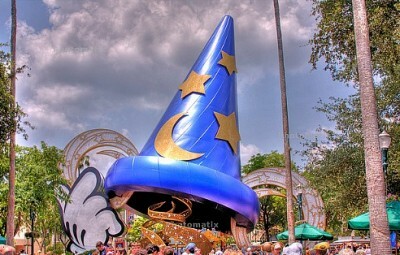 The Sorcerer’s Hat– Let me just start this off by saying “sad face”. I am one of the few and proud that loved the hat. Each time we went we took a picture in front of it. The hat made me smile like a pair of comfy pajamas after a hard day of work. It was an icon to me. Please pass me a tissue. 8. Mickey Mint Bars– These slender, minty, silk-like chocolate bars are melt in your mouth perfection. They are cleverly wrapped in smooth, green wrappers that resemble play money. The only problem with them is that they are SO DARN HARD TO FIND. I usually have to ask many cast members where they are located in the shop and much to my dismay 9 out of 10 have no idea what this blogger is talking about. When I find a stash of these at a shop within Disney I stock up, it’s as if I won the Lotto. I hoard these little chocolate wonders and wait till I get home to savor their sweet perfection. 7. Stitch’s Great Escape-I know it is in need of a huge refurbishment and I know there are some who will say that it’s time for this ride to close it’s doors and go back to the planet Euro, but it is my number seven guilty pleasure. Maybe it’s because that little alien reminds me so much of my son, mischievous, devilish and still cute, cuddly and adorable. When Stitch burps his chili dog in my direction, all I can do is laugh and go along with the gag. When Stitch “jumps” on my chair, I still get a little surprised and laugh. 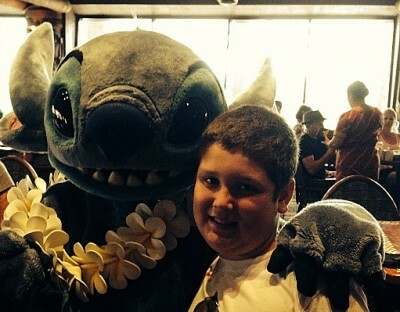 Yup, I’m still a softie for Stitch’s Great Escape. 6. Christmas Ornaments– I have never met a Disney Christmas ornament I didn’t like. In fact, that’s the problem. When we have our Downtown Disney day, my first stop is ALWAYS Disney’s Days of Christmas. When I walk in the store and see the hundreds of ornaments I feel like a small child on Christmas morning and my ability to reason is thrown to the wind. This store has a variety of hand painted ornaments, ornaments that celebrate special times in your life, ornaments for your favorite firefighter, doctor or nurse (to name a few). 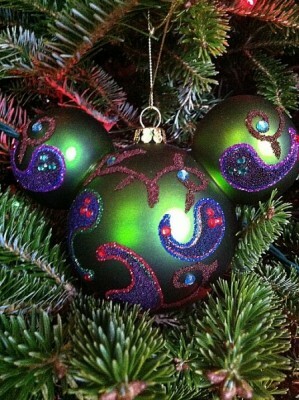 Ornaments can be purchased in a sleeve of six or more or a four pack. When you finally pick out that special ornament you can have it monogrammed by one of the lovely cast members that work there. What I like best about his store is that once I have picked out my treasure(s) I can have it mailed home. No worries about having to squish it into my luggage for the trip home. My new little treasure is securely packaged and ready to bring me years of happiness. 5. Doofenslurper– While this is not technically my “guilty pleasure” it is my son’s. Since this frosty, cool drink came out a few years ago, we are not able to leave EPCOT till he has sat down and drank one at the American Pavilion. The Doofenslurper is a sweet, slushie-like frozen drink . We have only been able to locate the Blue Raspberry flavor that is topped with Passion Fruit foam, but we hear there is Frozen Lemonade Doofenslurper out there somewhere and we would l like to try that one too. 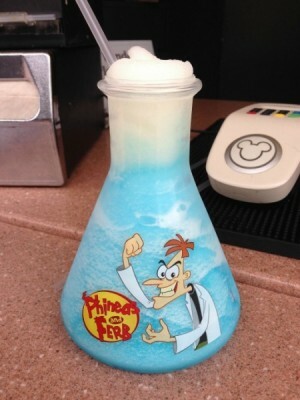 The Doofenslurper is served in a really cool “beaker”. Who could say no to that? 4. Mugs and Cups– The only way I can reason having six mugs and a multitude of souvenir cups and glasses is that I like to stay hydrated. If you ask my husband he will tell you that I could most certainly stay well hydrated with one mug and one Disney cup in my cupboard. What can I say? If there is a choice between drinking my lemonade out of a regular cup or a tall Disney Frozen cup with a bendy straw, I’m all about the fancy schmancy cup. 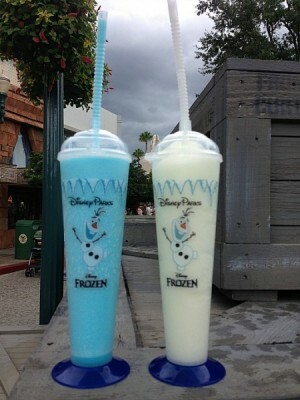 In my regular non-Disney life, I believe that water just taste better in my Frozen cup. 3. Disney Resort H2O soap– It’s time to come clean about my hoard of Disney soaps. Whenever I stay at a Disney Resort, I ask Mousekeeping to leave extra soap each day and they are more than happy to. This is how I know that I am not the only one with this “guilty pleasure”. A bar of Disney soap has a great, fresh, clean smell that just brings me back to early mornings getting ready for the park. 2. Beverages at EPCOT– After walking around EPCOT all day it nice to be able to get a cool, revitalizing drink at World Showcase. I have two personal favorites, the Grey Goose Slush in France and a margarita in Mexico. The Grey Goose Slush is a icy, refreshing adult beverage made with Grey Goose Limon Vodka. It is smooth and delightful on a hot Florida day. Be careful though, just like with a regular slush you can get a brain freeze if you indulge to quickly….I speak from experience. The margaritas at La Cava Del Tequila are made from the finest of tequilas. There are many specialty margaritas on the menu such as avocado, cucumber and jalapeno. If you are not in the mood to live on the wild side, why not try a traditional margarita. Still undecided? Try a margarita flight; a sampling of five different margaritas on the menu. While at La Cava you can enjoy also enjoy some tapas. 1. Walt Disney World– Going to Disney each year is my biggest “guilty pleasure”. The minute I walk on to Main Street, it’s a sensory experience that can’t be beat. The smell of cinnamon rolls wafting from the bakery, the hot, buttery popcorn fresh from the hopper, the clippty-clop of horse hooves, the smell of Pirates of the Caribbean and many, many more. These are the sounds that make me smile ear to ear from the moment I start my vacation till the moment I go back to “reality”. So, there it is my top ten “guilty pleasures”. Honestly, I could probably think of ten more. I’m sure you’re nodding your head in agreement with some of them and I am certain you are thinking of at least ten of your own. Next you travel “home” have a great time and enjoy your own list. Just make sure to save a few soaps for me.